The taxi arrived at five in the morning, but most of us had been partying all night so we were already awake. Showing few signs of life, and in some cases far from sober, six smelly blokes were decanted onto the Boeing 767 to Barcelona, and three hours later were shambling down La Rambla, Barcelona’s main drag, in search of beer. After a fairly extensive bar crawl into the late afternoon, we grabbed a couple of hours kip and then headed out for the evening’s entertainment. It was, we discovered, fiesta time in Barcelona. La Rambla was packed, not only with tourists and locals but also with musicians, buskers and street performers. Most impressive were the various sets of stilt dancers, performing complex rhythmic manoeuvres while dressed in outrageously coloured costumes. Followed by cunningly contrived mobile music machines (imagine a cross between a stage sound system and a bicycle), they swept through the crowd, terrorising passers-by with their demonic appearance and scattering firecrackers and confetti with gay abandon. At the seaward end of La Rambla is a pontoon that leads out to an artificial island in the harbour, a colourful line of bars and clubs known as La Moll d’Espanya. Entry is free, the atmosphere is friendly, and you are practically encouraged to wander from club to club, in an extension of the traditional evening perambulation. However, I wasn’t in the mood for dance music, so I left the others to it and headed off down to the quayside, where live bands were gearing up for the evening. After a little wandering, I settled on one band that interspersed creditable renditions of rock classics with traditional Spanish flamenco songs. An unusual mixture, but it really got us dancing. Much later, I grabbed a few hours of sleep at the hotel, and then was awoken by the others returning from their raving at around 6:30am. I took the opportunity to get up, grab a coffee , and head out on foot to the Sagrada Familia. 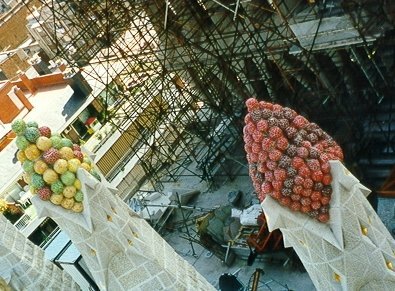 For those who have never been there, this is Gaudi’s crowning masterpiece. They have been building this weirdly organic cathedral to his original plans for around a century, and it is the most truly impressive piece of modern construction that I have ever seen. Each individually shaped stone is hand-moulded on site from concrete, and then winched into place. The first seven towers already grace the skyline like the arms of a stone octopus, and millions of tourists regularly clamber up the labyrinthine stone staircases, emerging onto trick balconies and buttress bridges high above the city. It had been five years since my last visit, and a fair amount had been achieved. The central space in what had previously been a bare shell now contained many floors of construction, an extra crane, and more scaffolding than I have ever seen in my life. At two points they had built high enough to incorporate what looked like the first supports for the central dome. For the first time, I began to believe that the cathedral may be finished in my lifetime. From the central Cyprus Tower my eyes once more followed the tree-lined Avenue Gaudi to the impressive building standing at the end. Usually it has been mid-summer and I’ve been wearing bike leathers, and so I’ve never actually walked up the avenue to see what it was, but this time it was below 30C and I was equipped with T-shirt and shorts, so once back at ground level I set off to find out. It was well worth it. The Hospital de Sant Pau is a genuine working example of Catalan architecture, beautifully embellished with multicoloured mosaics. There was something immensely pleasing about the juxtaposition of gothic architecture and modern ambulance equipment. I was now in a mood for walking. Clear across town is Gaudi’s last civil project, the apartment block called La Perdera. I had never been inside, so I spent a happy couple of hours exploring the apartments and clambering round on the roof before repairing to the building’s coffee lounge for a restorative sandwich. As I paid my bill, I heard firecrackers outside, a sure sign of a fiesta parade. Hurrying outside, I came across a huge construction like a hamster-wheel with a brightly dressed gnome inside. Various parts of the structure were wired to a drum machine, which he played by jumping around and hitting them. Two more gnomes high up on one of the Perdera balconies acted out a play about Father Time, and a band of black-clad men pushed oil drums in wheelbarrows while their partners beat enthusiastic percussion with hammers. They were the vanguard for another gnome standing in an enormous head constructed of white polypropylene bottles, pushed along at the top of a small crane by a group of struggling men. As if this wasn’t enough, a silver-clad girl floated by suspended from a big white helium balloon. When they do a parade in Spain, they do it in style. Having crossed half the city, I decided to finish the job and go to the park which sits on a hill overlooking the south-western suburbs. 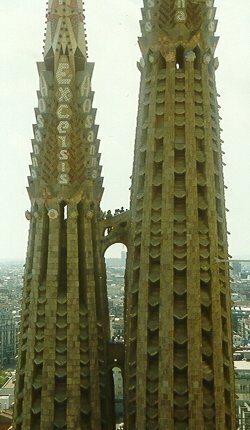 I had heard that there was another Gaudi church there, and this was as good as an excuse as any. When I arrived in the Place d’Espanya, it was clear that something was going to happen. All the way up the long series of steps leading to the palatial National Catalan Art Museum, engineers were scurrying around preparing thousands of fireworks. Halfway up the avenue, the concert speakers hanging from every lamppost emitted an ear-shattering crash and then launched into mind-numbing rock music. This was a sound-check as sound-checks are meant to be. There were a couple of dozen passers-by strolling along the enormous avenue, and none of us could resist a bit of a dance as the music swept irresistibly through our small frail bodies. After establishing that they were laying the groundwork for a son et lumiere spectacular the following evening, I continued my search for La Poblo Espanya, which turned out to be an artificial mountain village. For the 1929 Expo, copies of buildings from all the different regions of Spain had been crammed together into one place. Each region had shops selling crafts local to its area, and although it was all a bit Disney it wasn’t a bad rendition of a genuine Spanish village. The Gaudi church was nice too. From La Poblo Espanya there is a path that runs along the hillside to a cable car down to the seafront, but as I was ambling along I bumped into a couple of lost American ladies who gave me the return half of their ticket on the funicular, an alternative route down which I took with an Australian couple who were on month three of a two-year round-the-world trip. Once back on La Rambla, I was suddenly at a bit of a loss. I sat in a pavement bar for a while, waiting for something interesting to happen, but eventually decided that what I really needed was a good meal. After some searching I found a decent restaurant in a large square, and ordered myself a good feast washed down by some Faustino 1. Another lone guy sat down at the next table. He turned out to be a German called Ralf, an oil-worker in Aberdeen on his way back from an off-road motorcycle tour of Andorra. We got on pretty well, so after dinner we set off together to check out the quayside bands and bars, finally ending up outside one of the bars on the Moll d’Espanya drinking half-pints of whiskey and watching the girls go by. Unfortunately, at 2am I realised that my bag had disappeared from beneath our feet, containing my camera, phone and, worst of all, the last two rolls of exposed film. A trip to the police station revealed that the English-speakers didn’t work nights, so I headed back to the hotel for a few hours of bed. The others rolled in again at 6am, so I got up and after a much-needed coffee returned to the police station to give my statement. The waiting room was full of people who’d had their bags and cameras stolen at the same time and the same place; so there must have been a gang of streamers operating on the parade that night. Back at the hotel, the others were just getting up, and since they’d spent the previous day shopping rather than sightseeing I took them on the metro to the Sagrada Familia, borrowing a camera to re-take some of the shots that I’d lost. We then moved on to the Park Guell and spent a pleasant sunny afternoon ambling around Gaudi’s structures before heading back to the hotel for a change of clothing. It was now that we discovered that the lock had jammed on our room’s safe. Sealed inside were our passports and plane tickets, and since it was now Sunday night and we were due to check out at 8am Monday morning, we were understandably perturbed. However, with a little effort I managed to get reception to arrange for a locksmith to turn up at 7am, hopefully giving us enough time to catch our plane, and we set off for the Place d’Espanya and the promised firework display. The square and the avenue were packed with people. The music began, and the large fountain complex in front of the museum, bottom-lit by coloured lights, began to dance. Music of many different styles was mixed together higgledy-piggledy, perfectly traced by the finely controlled fountains. This was all rather impressive, but it was only a taster for the main event. After a long pause to sort out some technical problems, the music began once again. Starting with early classical tunes, the show moved through the years with medleys of musical styles from each period, concentrating on a Catalan theme, while the fountains danced and above them the fireworks flamed and exploded in time to the music. It was a huge spectacle, with all sorts of unusual fireworks, and enough different styles of music to keep everybody happy. Marshalls had been moving through the crowd giving out sparklers to all and sundry, and round about the nineteen-sixties a Catalan anthem began, and everybody lit up. Unfortunately, my sparkler turned out to be defective, and exploded into an eighteen-inch fireball. No sooner had it started then it was over, leaving me with two naked sticks and a hand that looked like a barbecued trout. I made a beeline for the ambulance. The packed crowds magically parted before me; clearly the expression on my face brooked no argument. It felt like the charring had gone deep, but there was no pain as yet and I wanted to get treatment before it started. The paramedics smothered everything in cream and bandages as the fireworks climaxed and the next victims began to arrive. Clearly there was a bad batch of sparklers out there. I was sent off to find the hospital, trailing the rest of our group behind me; walking fast to take my mind off the pain. The surgeon poked about, removed the worst bits of charred flesh, and after pronouncing that I would live, I was back on the street with an enormous bandage. 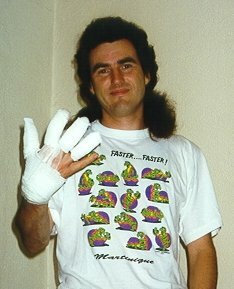 Two fingers were badly blistered, the end of my thumb was charred, and my middle finger had a big hole stretching for a couple of joints but on the whole I was in one piece. I had got off more lightly than one other guy, whose entire hand looked like a piece of flame-grilled chicken. I desperately wanted a beer, and would have been happy with the nearest bar (it was after all 2am) but the other guys had been sitting in a hospital waiting room for an hour and a half and wanted to head back down to La Rambla. Suddenly tired, I took some cans to my room and drank them in bed, noting with relief that the locksmith had already been, and that our passports were all intact. Eventually I dozed off until the guys came back, and then within hours we were back on a plane, heading for the office and a bright new day. 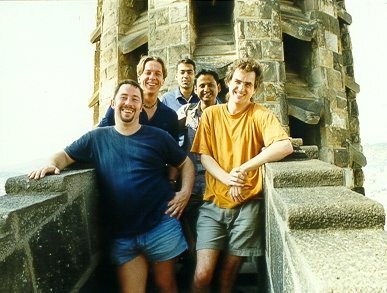 This entry was posted in Europe, Spain, Travel on 1999/05/21 by Reinhard.